While April 15 (April 18 this year) is the main tax deadline on most individual taxpayers’ minds, there are others through the rest of the year that are important to be aware of. 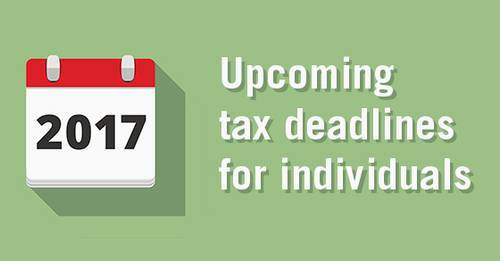 To help you make sure you don’t miss any important 2017 deadlines, here’s a look at when some key tax-related forms, payments and other actions are due. Keep in mind that this list isn’t all-inclusive, so there may be additional deadlines that apply to you. Please review the calendar and let us know if you have any questions about the deadlines or would like assistance in meeting them. File a 2016 individual income tax return (Form 1040) or file for a four-month extension (Form 4868), and pay any tax and interest due, if you live outside the United States. Pay the second installment of 2017 estimated taxes, if not paying income tax through withholding (Form 1040-ES). Pay the third installment of 2017 estimated taxes, if not paying income tax through withholding (Form 1040-ES). If you’re the trustee of a trust or the executor of an estate, file an income tax return for the 2016 calendar year (Form 1041) and pay any tax, interest and penalties due, if an automatic five-and-a-half month extension was filed. File a 2016 income tax return (Form 1040, Form 1040A or Form 1040EZ) and pay any tax, interest and penalties due, if an automatic six-month extension was filed (or if an automatic four-month extension was filed by a taxpayer living outside the United States). Make contributions for 2016 to certain retirement plans or establish a SEP for 2016, if an automatic six-month extension was filed. File a 2016 gift tax return (Form 709) and pay any tax, interest and penalties due, if an automatic six-month extension was filed. Make 2017 contributions to certain employer-sponsored retirement plans. Make 2017 annual exclusion gifts (up to $14,000 per recipient). Incur various expenses that potentially can be claimed as itemized deductions on your 2017 tax return. Examples include charitable donations, medical expenses, property tax payments and expenses eligible for the miscellaneous itemized deduction.